We are putting the spotlight on this lady to inspire other women to run, just like #thisgirlcan. Joining a beginner running group is a great place to start. Marcia who previously ran occasionally has become more of a consistent runner with the aid of a running community. With her Fly Girl Magic, her personal best for 5km run is 22mins, how amazing is this for only running once a week as a recreational runner. It's the holiday season, it's time to chill out, relax and forget your weekly routine for most of us. 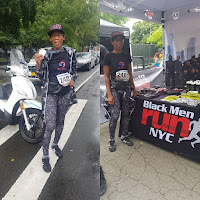 On holiday in New York Marcia couldn't resist her Sunday run and went to participate in an annual event organized by Black Men Run (BMR). Despite the heavy rain last Sunday, she joined hundreds of other runners men and women in the BMR 5th annual run festival. BMR congratulated Marcia on their Instagram story and was glad to have her from across the pond. The BMR encourages health and wellness among African American men by promoting a culture of running and jogging for beginners to advanced levels and creating a brotherhood. Likewise, the Fly Girls wellness mission is to promote wellbeing, one of the activities is to encourage all women to become more active by running and targets women from BAME communities. Has Marica motivated you! Our community has many inspiring women doing their little thing. Age is just a number, we welcome older women to get more active and do this for yourself. Runtogether groups are across the nation, join in one!